A multitude of different regulations and qualifying criteria exists in determining Independent Contractor classification, making it difficult to determine if a worker should be an Employee or an Independent Contractor (1099). The ClearIC evaluation program encompasses federal and state regulations to produce a clear, consistent, and documented process for 1099 compliance. ClearPath has incorporated industry-leading technology to automate the evaluation process, in a program managed by our experienced compliance specialists. You get the best of both worlds: online access to a logical, easy–to–use system, as well as attention to detail and expertise. This is what sets us apart. Prospective Independent Contractors and hiring managers complete a simple, quick, online survey based on IRS, Department of Labor and State regulations governing Independent Contractor classification. Contractors are then required to upload all supporting business documentation, which is verified and electronically stored. 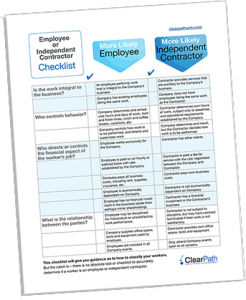 ClearPath Compliance Specialists analyze the completed surveys and review the supporting documents in order to recommend the appropriate worker classification. The recommendation is made after a comprehensive 5–Step, 2–Person Recommendation Process. Detailed notes are made during the review process to substantiate the recommendation and provide information on the key determining factors considered. All information is electronically stored in a Case Defense File to ensure full accountability of due diligence. Developed with time, accessibility, and security in mind, the online surveys can be completed in as little as ten minutes through our secure, encrypted compliance portal. Each step in the process, from the initial request to the final recommendation, is documented and date-stamped, enabling detailed reporting and review. In the event of an audit, the ability to demonstrate a clear and consistent process for validating 1099 contractors is critical. Recommendation notes made by the ClearPath compliance. All files are available in print or downloadable file formats. Your hiring managers, through innocent actions and bad practices, can unknowingly put your company at significant risk. ClearPath provides comprehensive education and training programs, combined with a change management strategy, to ensure the success of a new program. Our training programs include seminars, webinars, and training sessions for our clients, to educate key stakeholders and hiring managers on mitigating the risks of using contract labor. ClearPath’s Agent of Record program lets you engage, pay, and manage your Independent Contractor 1099 workers, Corp-to-Corp, and sub-vendors under one central contract. The result is an enterprise-wide process with consolidated billing and minimal administration, delivering significant cost savings. Consultants who do not qualify to be paid as an Independent Contractors can be converted to W-2 status via our Employer of Record service. Contact us to learn more about how our expert personalized service can let you get back to focusing on your business goals. Deonne Ramsey Manager, Talent Acquisition Trimble Inc.
ClearPath is very customer-centric. They have been great with assisting our team with getting our process mapped out and launched within our company.